Despite being about the same size, Earth (represented by the right half of this image) and Venus (the left half), have vastly different temperatures and other surface conditions. Exoplanet hunters have just made it easier to identify alien Venuses, in the hopes that doing so will lead to the discovery of more alien Earths. 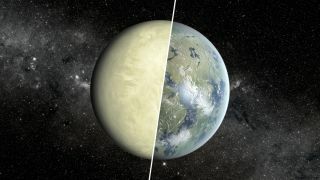 A team of researchers has delineated the "Venus Zone," the range of distances from a host star where planets are likely to resemble Earth's similarly sized sister world, which has been rendered unlivably hot due to a runaway greenhouse effect. "The Earth is Dr. Jekyll, and Venus is Mr. Hyde, and you can't distinguish between the two based only on size," lead author Stephen Kane, of San Francisco State University, said in a statement. "So the question then is, how do you define those differences, and how many 'Venuses' is Kepler actually finding?" The results could also lead to a better understanding of Earth's history, Kane added. Diagram showing the location of the "Venus Zone," the area around a star where a planet is likely to exhibit atmospheric and surface conditions similar to those of Venus. "We believe the Earth and Venus had similar starts in terms of their atmospheric evolution," he said. "Something changed at one point, and the obvious difference between the two is proximity to the sun." Kane and his team defined the Venus Zone based on solar flux — the amount of stellar energy that orbiting planets receive. The outer edge of the zone is the point at which a runaway greenhouse effect would take hold, with a planet's temperature soaring thanks to heat-trapping gases in its atmosphere. The inner boundary, meanwhile, is the distance at which stellar radiation would completely strip away a planet's air. The thinking is similar to that behind the "habitable zone" — the just-right range of distances from a star at which liquid water, and perhaps life as we know it, may be able to exist. The dimensions of these astronomical zones vary from star to star, since some stars are hotter than others. In our own solar system, the Venus Zone's outer boundary lies just inside the orbit of Earth, researchers said. Future space-based instruments — such as NASA's $8.8 billion James Webb Space Telescope, scheduled to launch in 2018 — will be able to analyze some exoplanets' atmospheres, helping scientists refine the Venus Zone concept, researchers said. "If we find all of these planets in the Venus Zone have a runaway greenhouse-gas effect, then we know that the distance a planet is from its star is a major determining factor. That's helpful to understanding the history between Venus and Earth," Kane said. "This is ultimately about putting our solar system in context," he added. "We want to know if various aspects of our solar system are rare or common." The telescope suffered a glitch in May 2013 that ended its original exoplanet hunt, but Kepler has embarked upon a new mission called K2, which calls for it to observe a range of cosmic objects and phenomena. The new study has been accepted for publication in The Astrophysical Journal Letters.